Road construction work is taking place on the northbound & southbound lanes of 25th Ave NE in front of the Surplus warehouse; traffic may be slowed down to single lanes. Entry & egress from the Surplus warehouse may be impeded during this time. Please exercise caution during this work, which should be complete in the next few weeks. For more info, please visit this SDOT page. Beginning February 4, 2019: purchasing hours for all priority groups (UW departments, registered non-profits, government agencies) will be M, W-F, 8:30 AM - 3:30 PM. Public hours will remain the same. Note: Surplus Receiving is closed on Tuesdays and the Friday before and Monday after Auctions. Please click here for a list of Surplus live auction dates. Click here for directions and a map to the UW Surplus Store. New Items Page: Updated every Friday. Click here. Please note that the Surplus Warehouse is closed the Friday before and the Monday after Public Auctions. Items designated for public auction will be removed from the sales area 10 days prior to the auction. Purchases will be charged to a budget or grant number. Surplus staff will prepare a sales slip which requires the purchaser’s name, budget name, budget number, box number, phone number, and campus location. Surplus will bill the designated budget or grant number via an Internal Sales Document (ISD). Department personnel may pick up purchases or request that they be delivered. Deliveries are scheduled through the Moving Services Program Coordinator and are done in the order they are received. Deliveries normally occur on Wednesday afternoons. Standard labor and transportation costs will be assessed for deliveries to all University facilities on the purchasing department’s budget number. Departments needing specific items may contact or visit Surplus Property to see if the items are available. The warehouse can be reached at 685-1573 or via email at surplus@uw.edu. State and Federal government agencies may purchase UW surplus property by visiting the warehouse between 8:30 PM - 3:30 PM, Monday, Wednesday - Friday; Tuesdays Noon - 6:00 PM. UW Surplus Property requires a list of representatives authorized to purchase on behalf of the agency, submitted in writing on the agency’s letterhead, and signed by an authorizing agency official. UW Surplus Property accepts credit card, government agency checks from state and Federal government agencies or they may be billed . Payment options also include billing the agency directly. Washington state sales tax will be applied to all store invoices. Federal government agencies are sales tax exempt. Purchases must be removed within one week of purchase. UW Surplus Property does not deliver purchases to government agencies. The Surplus Store is open to Non-profit organizations 8:30 PM - 3:30 PM, Monday, Wednesday - Friday; Tuesdays Noon - 6:00 PM. We often get large quantities of: desks, chairs, beds, and more. A copy of the Internal Revenue Service document that states that the organization qualifies as tax exempt under section 501 (C) 3 and the organization’s employer identification number (if not included on the IRS documentation). Click here to view an example. A list of representatives authorized to purchase on behalf of the organization. Authorization must be from the head of the organization and must be submitted in writing on the organization’s letterhead. Please ensure that the organization’s e-mail and phone number are also listed. Non-Profit organizations may pay for purchases by check or credit card imprinted with the name of the non-profit or can be billed. Washington State sales tax will be applied to all store invoices. Click here for more information about non-profit organizations and sales tax. Property purchased by a non-profit organization MUST be for the expressed use of the organization and is designated not for resale. Non-compliance of this policy may jeopardize the non-profit organization’s status as a priority purchaser of UW Surplus Property. The Surplus Store is open to the public every Tuesday, Noon to 6pm unless otherwise noted. 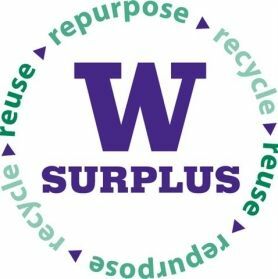 Members of the general public may purchase surplus items during the UW Surplus Public Stores, which are currently held every Tuesday from 12pm to 6pm. Items are on a first-come, first-served basis and are sold as-is. We do not hold/ reserve items for public purchase. Payment methods accepted for public sales are cash or Visa/ Master Card/ Discover. A completed resale certificate or tax exemption certificate is required at time of purchase for all buyers who wish to qualify for tax exemption. Items purchased at the Public Store must be removed within one week of purchase otherwise they will be put out for sale again, without refund, unless prior arrangements have been made. Pick-up hours are from 8:30am to 6pm on Tuesday and from 8:30am to 3:30pm on Monday, Wednesday through Friday. ALL ITEMS ARE SOLD “AS IS, WHERE IS.” ALL PURCHASES MUST BE REMOVED NO LATER THAN 1 WEEK AFTER PURCHASE. ITEMS NOT REMOVED BY THIS TIME WILL BE SUBJECT TO RESTOCKING INTO INVENTORY AND MAY BE RESOLD WITHOUT REFUND.